When leveling in Flyff, you need to know what to level on. Say, you are level 11 and you cannot decide what to train on, whether you should kill Lawolfs, Grownup Lawolfs, or even PukePukes! My guide will take you through the steps, and strategies on what to kill to level up faster. Before we get started, for the many people that have made Flyff leveling guides, MOST, if not all of them are based around having an assist, Billposter, or Ringmaster buffing and healing them. I understand that most new people do not know what buffs are. Buffs – Fighting enhancements, help in combat by improving performance. Buffs are very useful, it’s hard to find people willing to buff and heal you that are higher level than you. As a vagrant you can buff in buff pang located at central flarine ,river of weeping near lowolfs, in saint city, in pumpkin town in saint morning continent, and darkon 1 at erons factory. You can use buff pang from level 1 to 60. Buff pang gives only the level 7 buff. Heap Up – Increases Stamina. Level 1-5: You should work on easy level 1-2 Aibatts, and then work your way up to captains and then burudengs. By the time your done killing Aibatts, press I to go to your inventory, and click-and-drag your food to the F1, F2, F2, and so on buttons. Once completed, all you have to do during battle is press a key and the item activates. Level 5-10: You should attack Demain Urchains, or pukepukes. By now you should know how to do basic functions such as heal attack, move, speak, and use new items. Level 10-15 were the hardest levels in vagrant class for me to get through many think alike too. What you should begin leveling on is Lawolfs, Grownup Lawolfs, and Feferns. These get a little bit harder since you are higher levels and you don’t hit a lot. In every level it gives you a stats points, that you can distribute to any of the following str, sta, dex, int. From level 1 to 15 vagrant I prefer to distribute all stats point into str. So that you gain a higher attack. In flyff, there are 4 basic jobs. The 4 basic jobs are Acrobat, Assist, Mage, and Mercenary. Acrobat –Acrobats depend heavily on ranged melee attacks to fight, utilizing both Bows and Yo-Yos to combat enemies. Bows consume Arrows with each use, and Yo-yos have a slight chance to knock the target backwards. Since their weapons require both hands to wield, Acrobats are unable to equip a Shield. However, Acrobats have a wide array of skills geared towards stealthy and cunning maneuvers like Dark Illusion, which allows the user to turn invisible temporarily, and Crossline, which has a chance to stun the target. Acrobats make use of every stat except for Intelligence, which doesn't influence their damage, defense rate, or any aspect of their character except for their MP pool. Many players will advise against adding points of INT only to increase an Acrobat's MP, since the points are better spent in Strength, Stamina, or Dexterity. For Acrobats, Strength increases the attack power of Yo-yos, and Dexterity increases the attack power of Bows. To offset the Critical Rate, Accuracy, Evade/Block Rate, and Attack Speed bonuses that Dexterity provides, Dexterity does not add as much attack rate to Bows as Strength does to Yo-yos. When an Acrobat reaches level 60, they can change classes into either a Jester or a Ranger. Assist - The assist is the priest or medic in Flyff. Two primary builds are FS, Full Support, the healer or BP the fighter. Both have the same skills to chose from. Where the FS will need a partner to level the BP build may self-buff and fight on there own. The Assist is the first class the get and AoE attack. The assist may chose from Ringmaster and Billposter at second job. Mage –Magicians are ranged spell casters, they are able to focus large amounts of magic upon an enemy, dealing a great deal of damage before they are even reached. Magicians generally have lower defense, lower HP, and sometimes even delay when it comes to casting spells. However they are able to cast spells that not only damage enemies, but slow them down as well. Silent and mysterious, the magicians will always mystify curious eyes. At level 60 you can change 2nd job to psykeeper or elementor. Mercenary –The Mercenary class is normally the first choice of newer players. These hack and slash characters are easy to level and don't require much money to raise. Being basically just click and wait they make it easier to learn the game mechanics. There are many types of Mercenaries those going for Blade on second job would go mostly Dexterity. If you see someone who is but a blur as they hack away then most likely you have just encountered a Blade. Those going Knight would go more for Stamina. The Knight class is what most players fondly refer to when they speak of the human meet shield. These guys can take a hit. Leveling is easy if you have full buff from ringmaster or assist with higher buff, you can buy the basic needs in npc like weapons and suit.and awaken it for extra. additional stats .To awaken a piece of equipment, take it to (Jewel Manager) Peach in Flarine. On her menu you will see the option "Trade." Here you can purchase a Scroll of Awakening. In the same manner as upgrading items:Double Click the Scroll and click on the items that is going to be awakened, and wait. In a few short moments, the stats will be shown on the item. In leveling i suggest to kill monster by higher than your level for at least 3 to 5 level for higher experience gain. killing higher than 5 is hard for soloer because you can get easily killed. unless you have a ringmasters buff. you can also double your experience gain by buying scroll of amplification, stack it for 3 and gain 2.5 % of your experience in an hour. join also a contri party for additional experience gain. You can used you map for gathering info, like finding the right way to you destination. press M for map info. for example you are level 20 and want to to level up and kill monster correspond to your level. press M. then click saint morning then click monster info. in monster info you can see the monster level and there location. As you leveling up your stat points are going to increase, you can distribute it by according to your job classes, i suggest if you are aware and have a good stats build for your class. 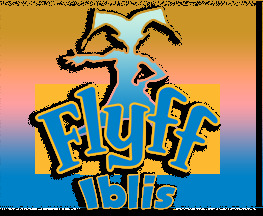 you can search it by google , you can join in flyff ibliss discord. and ask online players for your guidance.